Breakfast is important to eat, but more important is WHAT you eat for breakfast. Sugar and fat in the morning is not a recipe for a good day. The SAD (Standard American Diet) breakfast consists of too much sugar, fat, and believe it or not...protein. The leading cause of cancer in the U.S. is colon cancer, which is in part caused by too much animal protein in the digestive system. Bacon, eggs, sausage, dairy milk, etc. are all full of fat and more protein than is needed in one meal. Sadly, children still eat an abundance of sugared cereals, pop tarts, and such, which are counterproductive to good health. This cereal bowl is a bowl of life-giving nutrients, is low in fat, and still has PLENTY of protein. Whole grains and plant-based milks contain all the protein you need for breakfast; however, they don't contribute to colon cancer--in fact--the fiber in them prevents it! 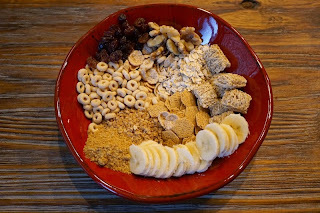 Just mix a combination of wheat, oat, and barley cereals with 1 T. flaxseed meal, 1 T. of walnuts, old-fashioned oats, and some fresh fruit, and you've got yourself a BOWL OF LIFE.